Information theory and inference, often taught separately, are here united in one entertaining textbook. These topics lie at the heart of many exciting areas of contemporary science and engineering - communication, signal processing, data mining, machine learning, pattern recognition, computational neuroscience, bioinformatics, and cryptography. This textbook introduces theory in tandem with applications. Information theory is taught alongside practical communication systems, such as arithmetic coding for data compression and sparse-graph codes for error-correction. A toolbox of inference techniques, including message-passing algorithms, Monte Carlo methods, and variational approximations, are developed alongside applications of these tools to clustering, convolutional codes, independent component analysis, and neural networks. Algorithmic information theory studies description complexity and randomness. 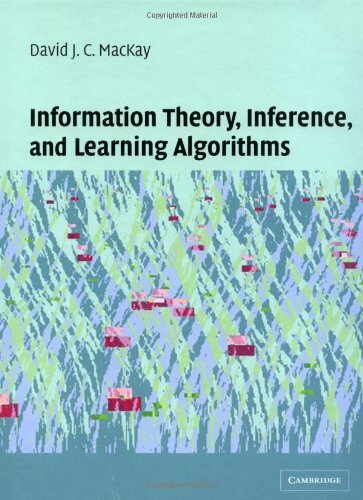 This text covers the basic notions of algorithmic information theory: Kolmogorov complexity, Solomonoff universal a priori probability, effective Hausdorff dimension, etc. A short review of ideas in quantum information theory. Quantum mechanics is presented together with some useful tools for quantum mechanics of open systems. The treatment is pedagogical and suitable for beginning graduates in the field. Processing of information is necessarily a physical process. It is not surprising that physics and the theory of information are inherently connected. Quantum information theory is a research area whose goal is to explore this connection. The final version of a course on algorithmic information theory and the epistemology of mathematics. The book discusses the nature of mathematics in the light of information theory, and sustains the thesis that mathematics is quasi-empirical.